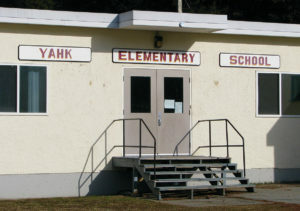 Sadly, on the east side of the Kootenay Lake School District in BC, we have seen the closure of three schools—South Creston Elementary (2003), Wynndel Elementary (2008) and Yahk Elementary (2016). (South Creston now operates as the Creston Education Centre, but that may change within the next year). The buildings will continue to deteriorate and will either be sold or need to be demolished. They will eventually disappear from the landscape and continue on only in memory. Though I have spent time in all three schools, the one that is most memorable is the small two-room school tucked into the woods in the unincorporated hamlet of Yahk. Though I had to get up early and drive half an hour, I enjoyed teaching in a multi-grade setting, where older students helped the young students and there was a strong sense of family. I didn’t always appreciate having to wrap every student in winter clothing so we could trudge down the narrow trail to the Yahk-Kingsgate Community Centre for gym time, but I liked the quiet setting and the manageable class size. Not all my memories of teaching in Yahk are of smiling children, story-time and silly science experiments. There was also the time I accidentally set off the alarm and had to wait for the police to show up as I sat outside on the steps one chilly winter morning. Strangely, this embarrassing story didn’t occur during the year I taught part-time at the school, but three years later when I was working as a substitute teacher. After my teaching stint in Yahk I had a position at Homelinks but, when various school programs were shut down and I was bumped out of my position, I was at the mercy of my cell phone once again. One of my first calls that year was for a full day in Yahk, and I was excited to catch up with the students who still attended the school. I knew it only took about half an hour door-to-door, but I left home early so I had time to pick up the school key from Erickson Elementary School and look over the plan for the day as I enjoyed my morning coffee. “Do you need an alarm code?” asked the school secretary as she handed me the key. I arrived early and mine was the only car in the small parking lot. As I walked towards the building, I was looking forward to twenty minutes of quiet before the onslaught of young children. I walked up the wooden steps to the front door, unlocked the door, and heard the familiar staccato tweet from the alarm system that reminded me I had three minutes in which to punch in the code. That’s when I realized I had forgotten where the security keypad was located. I checked near the front door but I couldn’t find it, and I frantically searched up and down the short hallway. I looked inside the office. Time was quickly ticking down. After two minutes that felt nothing like two minutes, I finally found the keypad behind a small, locked metal panel. Luckily, the key that unlocked the front door unlocked the metal panel, and I had just enough time to punch in my code. I was expecting a quick beep to confirm that my code was valid and I could continue on with my day. But there was no quick beep. I tried again, but again there was no quick beep. I tried a third time—still no beep. That’s when my three minutes were up and a loud, shrieking alarm filled the quiet of Yahk Elementary. The noise was so intense that I decided to copy the number into my cell phone and head outside, rather than use the phone in the office. I turned around, went back up the steps and tried to open the front door. The door was locked. I reached into my pocket for the key. No key. I checked my pockets again—still, no key. Then I remembered something. Peering through the front door window, I could just make out my key still in the metal panel. “Double dang it,” I said. There was no way inside. I had no other option but to sit on the steps and wait for the police to arrive. Feeling restless and a little nervous—not to mention embarrassed—I paced around the parking lot. I wasn’t sure how I was going to explain what I had done to the first attending officer. It wasn’t long before I spied a white cruiser through the sparse bushes that separate Railway Avenue and Highway 3. “Well… that didn’t take long,” I said to myself.I expected the car to turn off the highway, cross the tracks, and drive towards the school. But it didn’t. The cruiser drove past and kept on its way to Cranbrook. Soon after, the alarm turned off. A few minutes later, a staff member arrived and I explained what I had done. “If you don’t tell anyone, then I won’t either,” she said. That afternoon, a man with a handyman’s belt arrived and started tinkering with the keypad. He looked confused. “Did you notice anything strange this morning with the alarm system?” he asked me.